New Incline Belt Conveyor Sections by KBR Machinery Conveyor Sections. 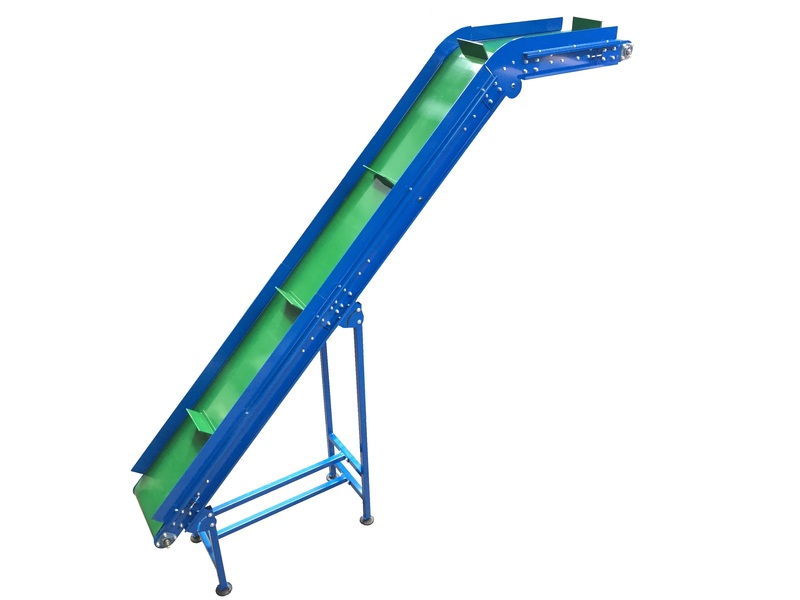 We manufacture our own line of New Belt Conveyors, from our site in Telford Shropshire. We have heavily invested in our manufacturing facility. We are in control of our own conveyor belt manufacturing design, steel processing, finishing and assembling of conveyors from start to finish. We offer our own KCB Range of new belt conveyors customers, along with having the experience to design and build custom belt conveyors to suit specific applications. To speak to us about your new belt conveyor requirements, Please Contact Us. 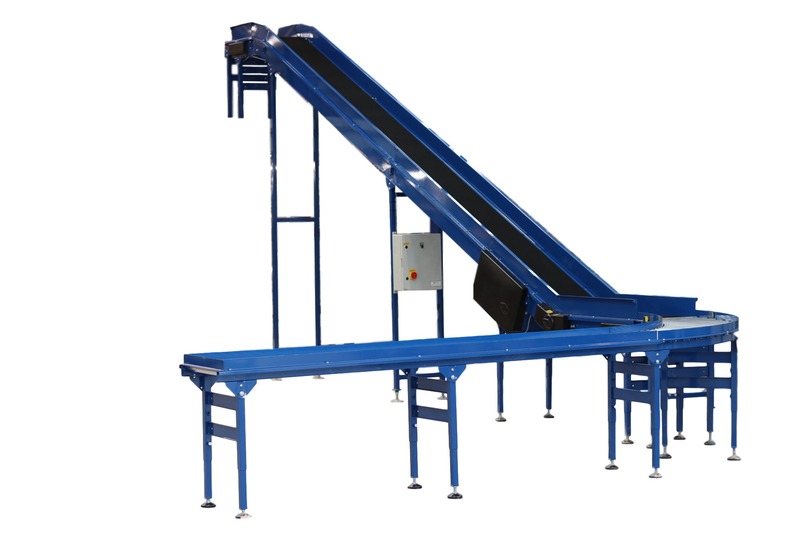 Our KCB New Belt Conveyor range has been designed to suit a number of general conveyor applications. 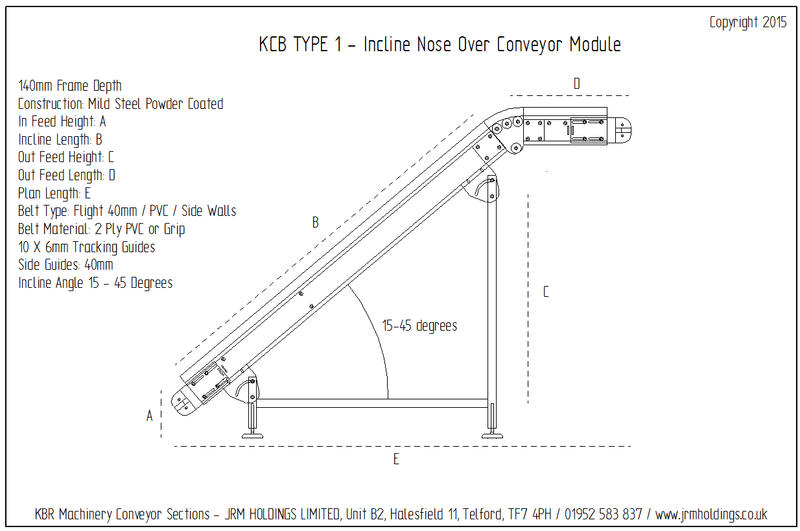 KCB Type 1 – Incline Nose Over Conveyor Module – Belt Widths 230mm – 1230mm. Incline Angles 0 – 45 Degrees. 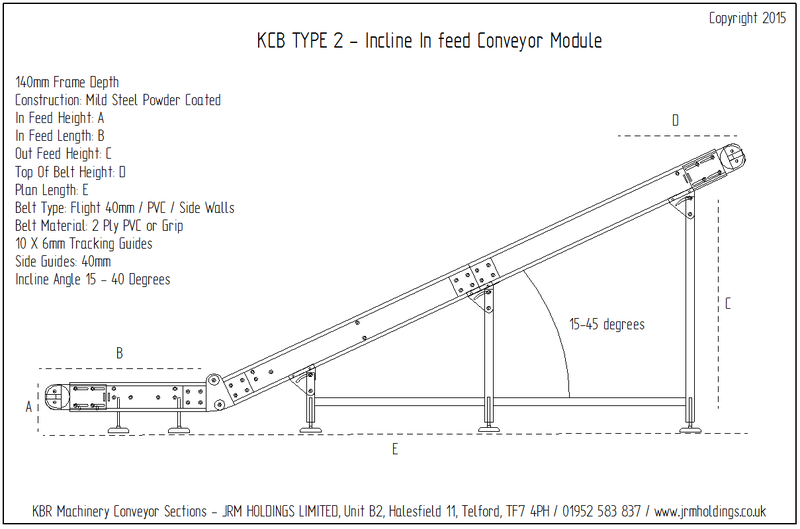 KCB Type 2 – Incline In feed Conveyor Module – Belt Widths 230mm – 630mm. Incline Angles 0 – 45 Degrees. 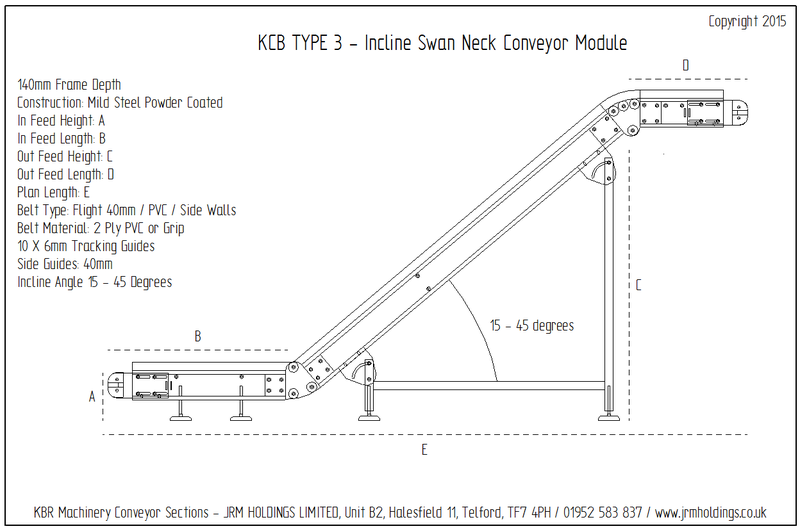 KCB Type 3 – Incline Swan Neck Conveyor Module – Belt Widths from 230mm – 630mm. Incline Angles 0 – 45 Degrees. 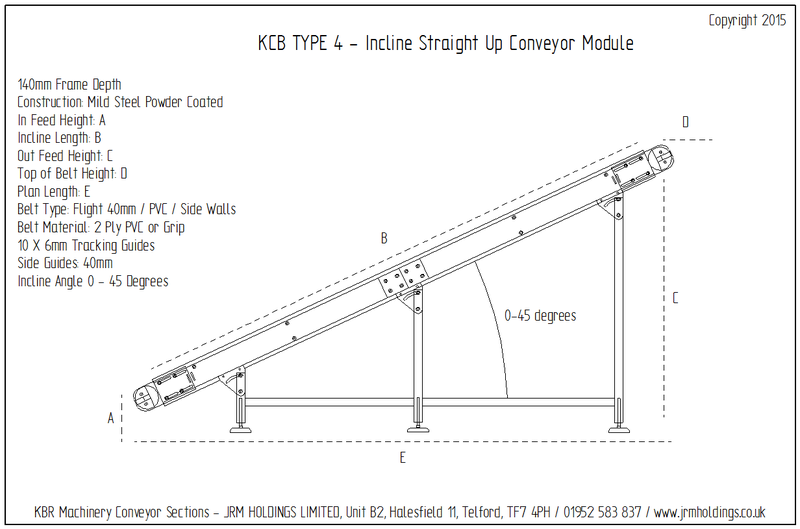 KCB Type 4 – Incline Straight Up Conveyor Module – Belt Width from 100mm – 1230mm. Incline Angles 0 – 45 Degrees. 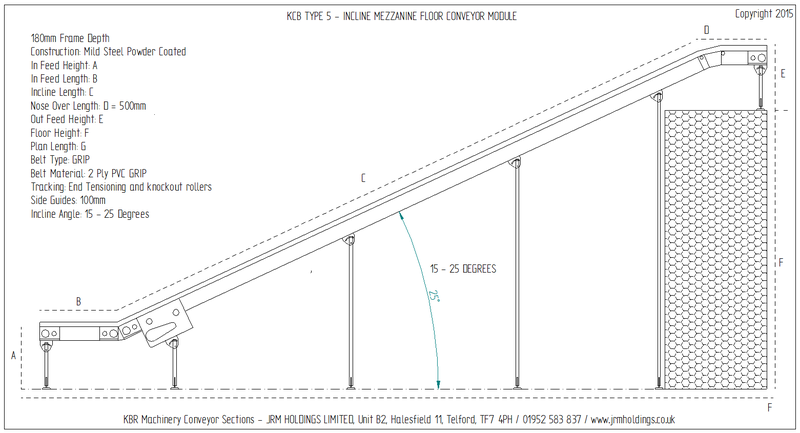 KCB Type 5 – Mezzanine Floor Conveyor; Belt Widths from 350mm – 1050mm. Incline Angles 15 – 25 Degrees. Direct On Line Starter (3PH) Stop/Start. PEC Sensor Kits and Timers. Mobile Swivel Braked Castor Frames. Side Mounted Gear Boxes available as Standard. 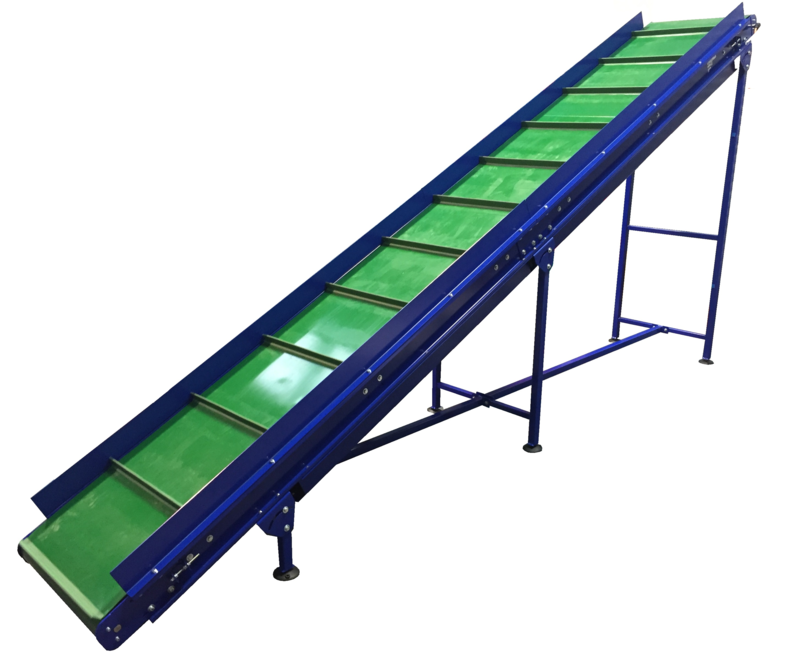 Our KCB Belt Conveyor range has been designed to suit our own range of New Powered Belt Conveyors. The KBR Machinery New Belt Conveyor Range can be integrated in to the following ranges. Full electrical control systems can be designed and manufactured to suit your intended requirement, application and layout. 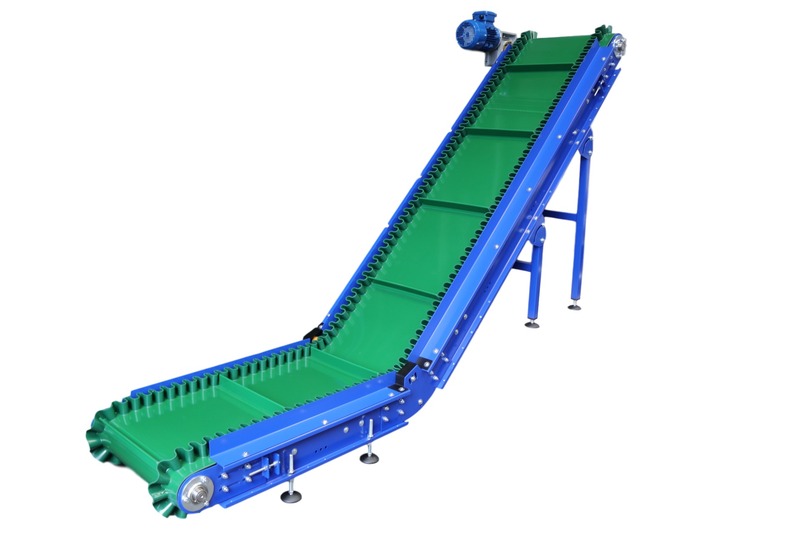 How does a Incline Belt conveyor work? A Basic Incline belt conveyors works by incorporating two rollers; One being an idled pulley and another being a powered pulley. These rollers are then set in to a solid frame typically made from steel, stainless steel or aluminium profile. Manufacturers will folded this frame using a brake press, as a solid C section with a reverse bend, or Create two parallel Z sections to be joined together. When using a Z Section the two frames will be joined together using a cross brace. Cross braces are typically welded bars and/or bolted cross members. 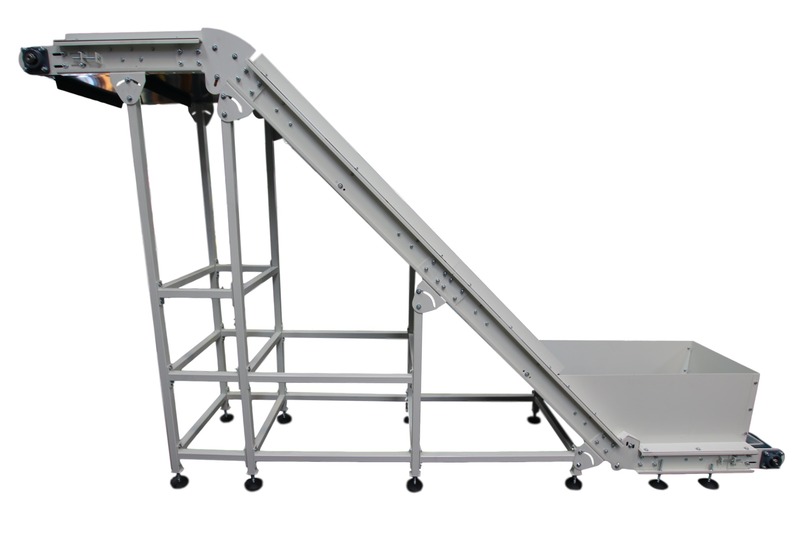 The Slider bed of the conveyor, will usually be decided based on the application of the conveyor. In warehousing slider beds will usually be made up either using rollers or folded steel sections called bed pans/trays or bed sections. The advantage of using bed rollers over pans, would be that the load over the drive will be decreased dramatically, as the friction derived from the belt is far less. This advantage is particularly important, when considering the drive size required to pull the necessary force to be placed on the belt. And can also be an advantage when considering the total power consumption of a belt conveyor system. Drive Locations can also play an important part on a belt conveyor. Typically a drive would sit at the end of the conveyor to pull the belt in the correct direction of travel. When belt conveyors are required to be functional in forward and reverse directions, or considering a belt length over 10m, it will be fairly common practice to expect these conveyor to have a centrally located drive unit.